EASY TO INTALL-A simple press could easily install this product to a smooth surface where appointed.Vacuum Hook Suction Cup Super Strong Hook for Office, Kitchen, Bathroom,Car,motor Cars,Travel bags,Hiking etc. ECO-FRIENDLY MATERIAL-The sucker is made of ABS environmentally-friendly material,which providing an anti-freezing,anti-rusting and waterproof function . MORE EFFECTIVE IN THESE PLACES-Suction works best on ceramic tile, glass, mirror, granite, stainless steel, acrylic, laminate and any non-porous surface with glossy finish. The suction power relies on draining air out of the sucker cup, so the surface must not have any concave-convex, holes, liquid or anything else. The others non-smooth surface please use 3m adhesive dics frist(provided),such as rough wood,emulsioni paint,textured tile,etc.Stick the 3m discs to the wall first.and then attach the suction cup to the disc. 1.Please ensure the surface is dry and clean,otherwise it will reduce the adsorption capacity of suction and then drop down. 2.Please do not hang anything which is fragile. 3.Away from fire,in case of melting. 4.Do not use for hanging people, in case of any injury. 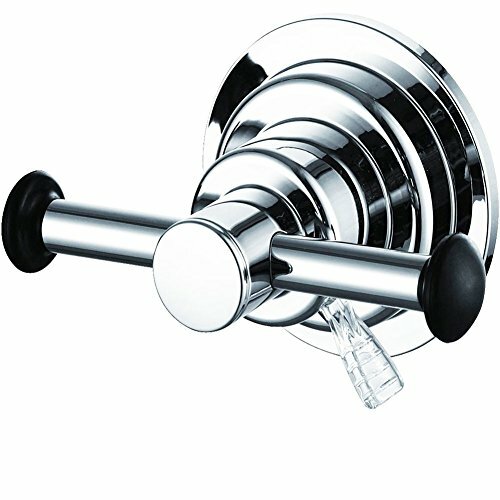 MORE LARGE SUCTION CUP MORE POWERFUL ADSORPTION:BOPai suction cup diameter is 3.15-inches large. in good air tightness of the silicone material,Provide the strong calability of adsorption.It can bear 7.5pounds maximum and keep it for about 1 year,Just a piece of cake. WIDER EXPAND DISTANCE:5-Inches Sided CROSS-BAR Provide Wider Distance of both ends.Effective to Expand a wide item(like for better drying Towel;Better Holder lager robe,etc) or Better holder two items by More Distance.Suitable for hung up towel,washrag,bath robes,loofahs,coat,bag,etc in bathroom,ketchen,bedroom,outside.At both ends of RUBBERY DESIGNED to PREVENT ITEM OFF and hold it persistent. EASY INSTALLATION & REMOVEABLE CAPABILITY:No Drills .No Screws.It has a convenient adsorption control switch.Suction cup easy to Installation and for Relocating. USABLE RANGE:Suction Cup works on smooth and no concave convex surface,such as ceramic tile,glass,smooth wood,stainless steel,etc;The others than smooth surface such as rough wood,emulsioni paint,textured tile.should be use the 3m sticky pad which we have provided in package. If you have any questions about this product by BOPai, contact us by completing and submitting the form below. If you are looking for a specif part number, please include it with your message.